I broke ground on a new garden this year, and I will admit the goings have been mixed. Some things have been great, and others not so great. Great? The years and years accumulation of organic composted cow manure we shoveled out of the old barn and spread on the garden. The soil is flat, nicely aerated, gets great sun and the creek is nearby for irrigation. The new plot is in an open, fairly unsupervised location far from human habitation and near to the creek. While it is a sizable drop to the creek from the garden, a short stroll brings you easily to a quiet pool deep enough for a hefty drink and a leisurely bath. I planted corn, fodder beets and two kinds of pumpkins, and have been grooming a future site for a sizable strawberry patch. While our start was a little slow due to the drought, all my little plants still did their best. 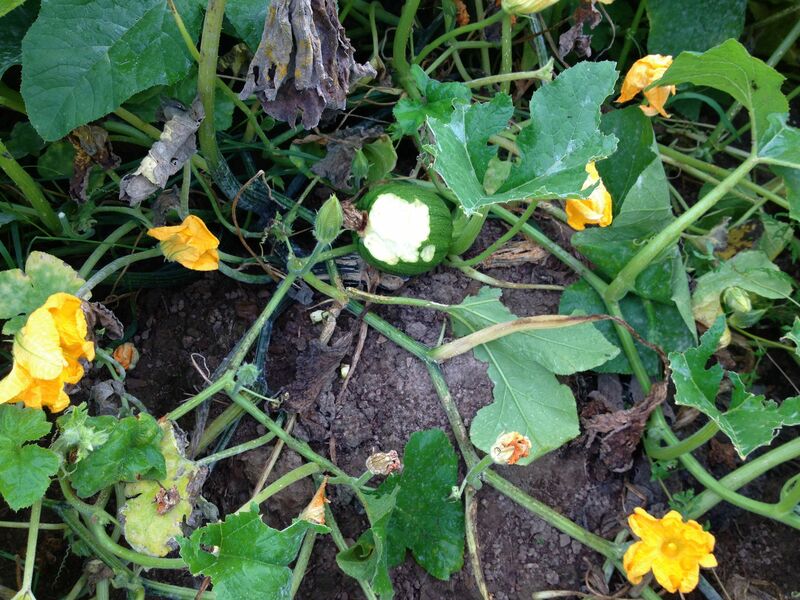 The corn was promising, the beets coming up slow but sure and the pumpkins were taking prisoners. It wasn’t long before the tiny stalks of corn had been trimmed as if with scissors; neatly, evenly and not a single plant spared. The deer tracks left little doubt who the culprit was, and since the deer word for crack is c-o-r-n, I really can’t say I was all that surprised. Once I accepted the fate of the corn and moved on, we had benefit of a few rains and things really started showing promise. 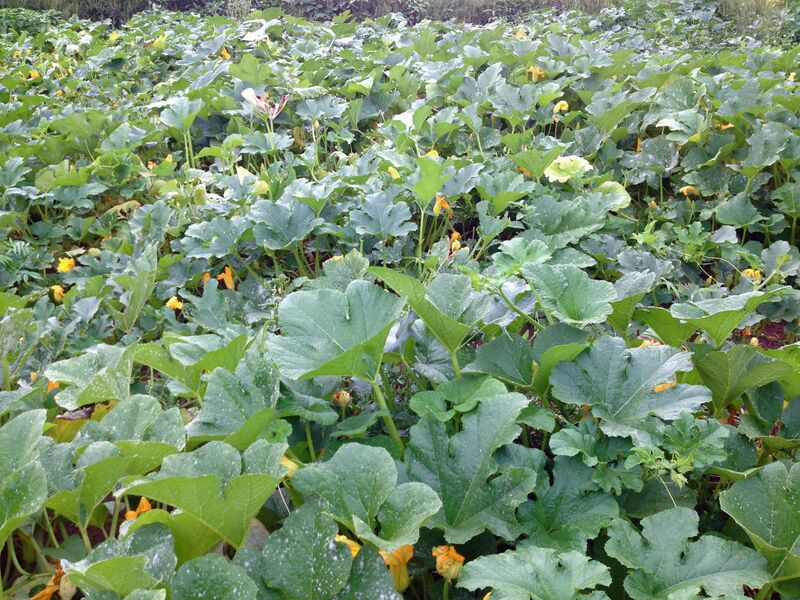 The beets started to get big and bushy and stand up in tentative rows and the pumpkins began to vine and bloom all over the place. I was pleased to see the first green orbs, and began planning my pumpkin extravaganza. I imagined pies, pumpkin caramel sauce, gnocci, ravioli, gnudi and candies. There’ll be roasted pumpkin, smashing pumpkins, toasted pumpkin seeds, pumpkin puree, pie filling and who knows what else. 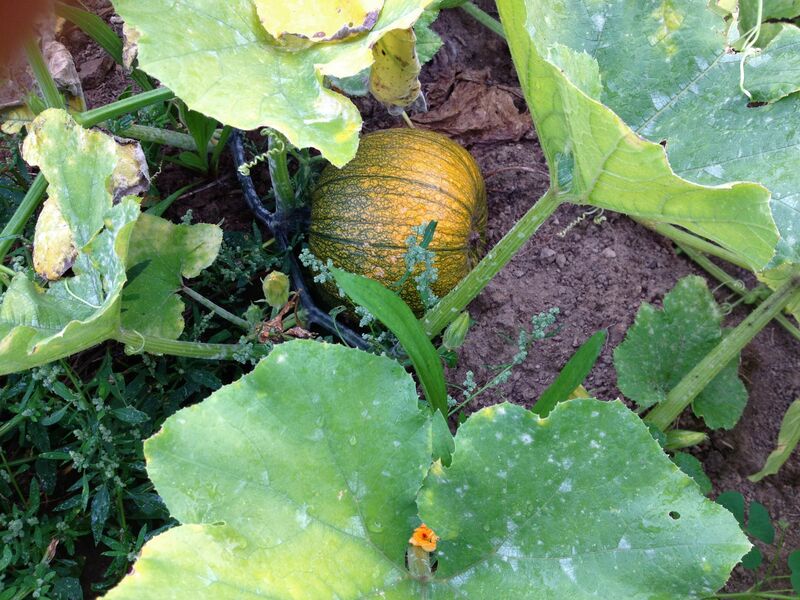 Of course the Ladies will be part of the Pumpkin-fest too – there are special fodder pumpkins for them too. What’s cuter or more peace-loving than a groundhog? They harm no one, love fruits, veggies and sunshine and go about their gentle business of getting really, really fat. Which presents a quandary. I like groundhogs. But, there always has to be a but doesn’t there? And the digging! 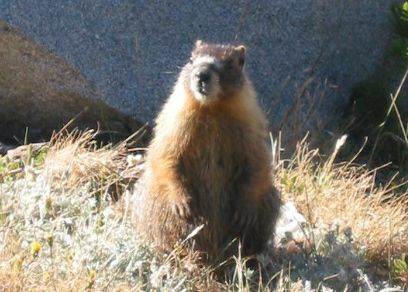 Groundhogs will dig a treacherous underground network you have to see to believe and you’d better hope that your barn or garage isn’t in the way. Their holes pose a leg-breaking menace to livestock and equipment. So my animal-loving friends, what’s a farmer to do? I tend to be a little more lenient with the groundhogs than my neighbors. But even the most liberal urbanite-turned-country-dweller will have a crises of kindness when their peace-loving kumbaya theories are confronted with such a relentless and downright disrespectful agent for Nature. Don’t think it could happen to you? Don’t be so sure – just ask Michael Pollan. Read about his epic battle with our chubby four-legged vegans here. Like Scarlett O’Hara, I’m not going to think about groundhogs today, but tomorrow is coming and a decision will soon have to be made. So glad we don’t have to deal with groundhogs. Rabbits, pigeons and squirrels in my garden. And we have deer too. Squirrels don’t seem to care much for the garden here, but plenty of bunnies & deer. First earth dogs, then a general garden dog. lol. HA! Do you have recipes for those Laura? 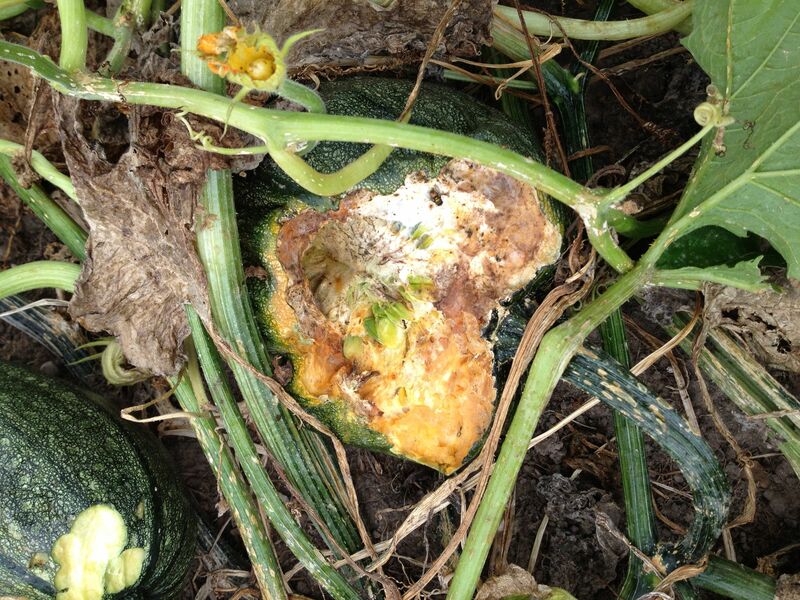 Groundhog, Woodchuck, Whistlepig, whatever you want to call them they are destructive! I don’t mind them in the timber or even in the margins but they will spread if not kept in check. The coyotes have been doing a good job here but before they came a .22-250 proved to be very effective. If you are adventurous you could live trap them and relocate them under the cover of night. I wouldn’t want to be caught doing such a dirty deed though! I am jealous of the pumpkins! We planted several for Lily and not a single one survived. Currently we are trying to keep the dog from eating the ripe tomatoes off the vine! When you hunt them, if you whistle they will sit up to look around and present a perfect target. If you miss they look like a little pig running away. That is my theory anyway. My husband ate a ground hog dish one time at a wild game dinner…he said it was good and they are pretty healthy meat I hear…sorry, no recipe though! I do have some good cook books for venison! (You have to modify most of the recipes due to ingredients like canned creamed soups and all) They are Quality Venison I, II, and III by Steve and Gail Loder. Funny about deer crack Jackie! 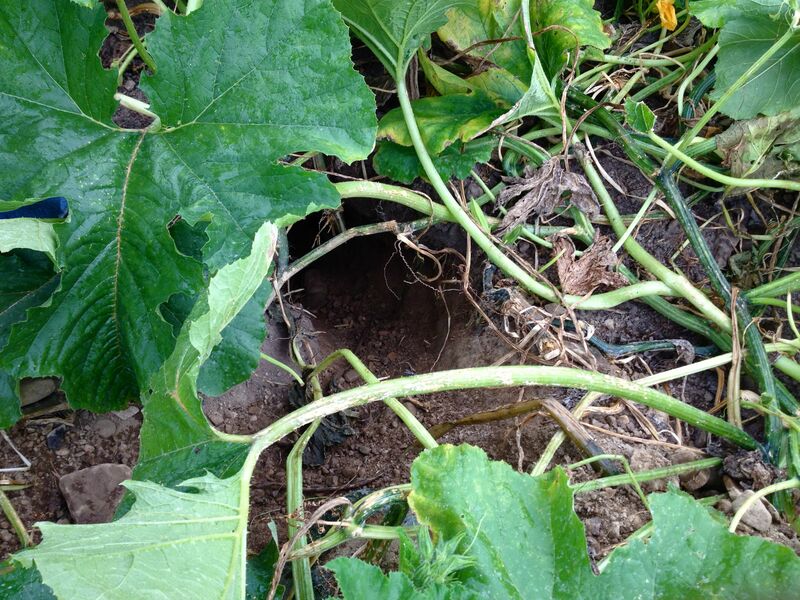 We have an issue with rabbits and wild pigs (javalina). Javalina LOVE pumpkins and you always know it when it’s halloween and they eat your jack-o-lanterns. I am getting reading to put webbing around my tiny garden boxes. I’ve never heard the term javalina before. Interesting. Are they big? Not giant but they seem big to me. 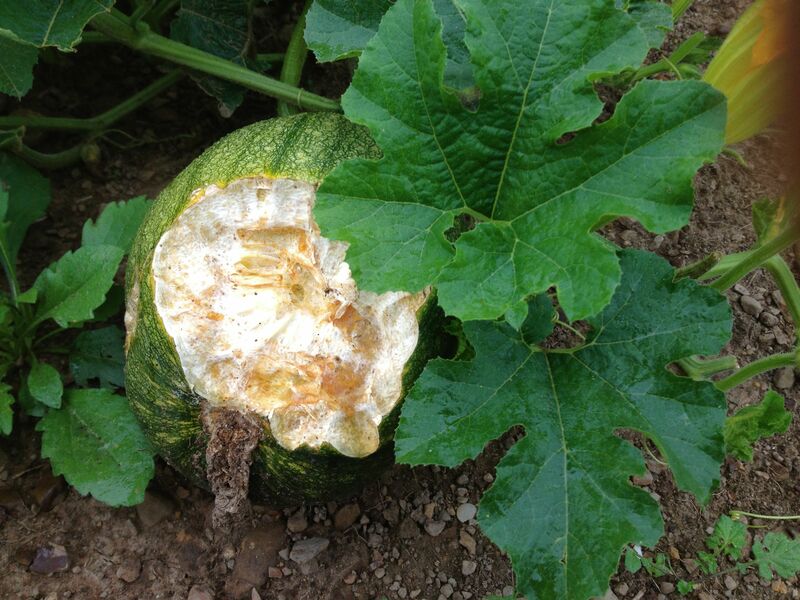 Pumpkin problems like mine from a friend’s blog.